The 21st Century Beetle offers an agile, driver-oriented coupe experience with a quality of materials that goes beyond all class limits. The car’s styling, ergonomics and quality interact to create a new, friendly car with a highly individual nature. The shape and use of color in the painted or carbon-look dashboards harkens back to the design of the first Beetle. Three round instrument gauges are arranged in front of the driver (tachometer, speedometer, fuel gauge) providing all key information at a glance. A multifunction display is integrated in the speedometer in middle position. The steering wheel is specially designed with optional painted accents in the spokes, depending on the equipment line. Framed by two air vents, the selected audio/navigation system is optimally located in the driver’s visual field on the dashboard. Within easy reach, climate controls are situated just below. Similar to the original Beetle, the new car has an extra glove box integrated into the dash. The lid folds upward, while the standard glove box opens downward. Another classic feature: the optional auxiliary instruments above the selected audio/navigation system: oil temperature, clock with stopwatch function and boost pressure gauge. 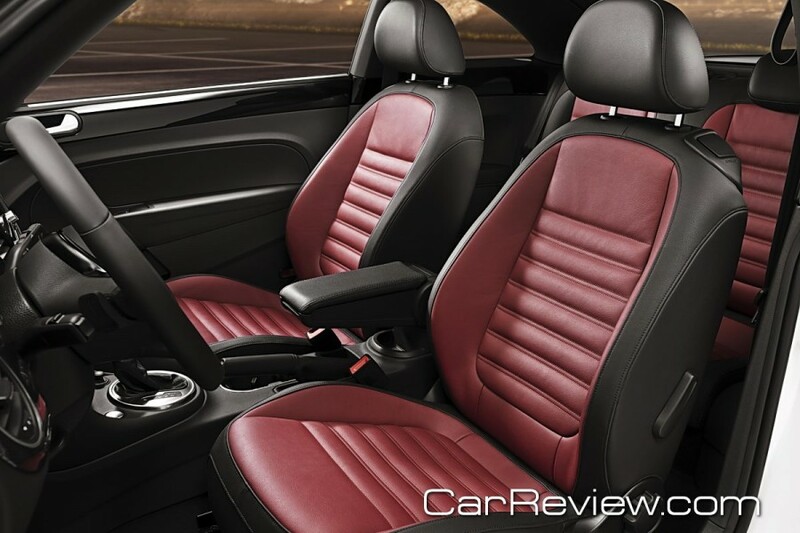 The “cathedral ceiling” dome roof of the New Beetle has been replaced with a sleek and sporty roofline. Front and rear passenger headroom remains plentiful. In the rear seating area, the longer roof section results in more space. The trunk is significantly larger, offering 10.9 cubic feet of space. A split-folding rear seat and a wide opening trunk lid ease loading and unloading. The 2012 Beetle will offer three engines: the 2.5L gasoline five cylinder, the 2.0L TDI® Clean Diesel and the 2.0L TSI® turbocharged gasoline engine. Transmission choices will include a 5-speed manual or optional 6-speed automatic on 2.5L models. 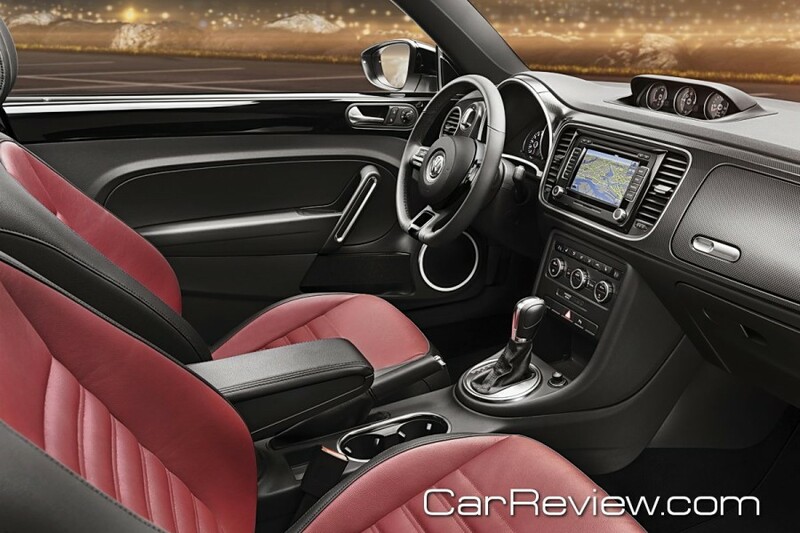 Volkswagen’s acclaimed DSG® 6-speed dual-clutch transmission will be offered on the TDI Clean Diesel and 2.0L TSI turbocharged gasoline models, while a 6-speed manual will come standard. The 2012 Beetle 2.0L TDI Clean Diesel is the most fuel-efficient Beetle ever. The quiet, four cylinder 2.0L TDI Clean Diesel engine produces 140 hp and 236 lb.-ft of torque. It meets all U.S. emission limits and offers manufacturer estimates of 40 mpg highway, 29 mpg city, and 33 mpg combined. Fuel economy values are also improved up to 10 percent over prior 2.5L five cylinder engine models. Mated to a 5-speed manual transmission, it offers manufacturer estimates of 22 mpg city and 31 mpg highway. The optional 6-speed automatic offers manufacturer estimates of 22 mpg city, 29 mpg highway. The five cylinder engine produces 170 hp and 177 lb.-ft of torque. The Beetle 2.0L TSI is the sportiest model offered. With 200 hp and 207 lb.-ft of torque, power delivery will remain smooth and direct across the rpm range. The four cylinder turbo engine is estimated to provide 30 mpg highway fuel economy. To ensure that power is applied properly in challenging conditions, the 2.0L TSI model features the XDS® cross differential (limited-slip) system. The system electronically monitors input from various wheel sensors and, in the event of slippage, transfers extra torque to the wheel or wheels with the most traction. Apparently, 60% of the previous generation Beetle were sold to women. Now that the flower vase is gone, will sales of the 2012 Beetle increase for the men?